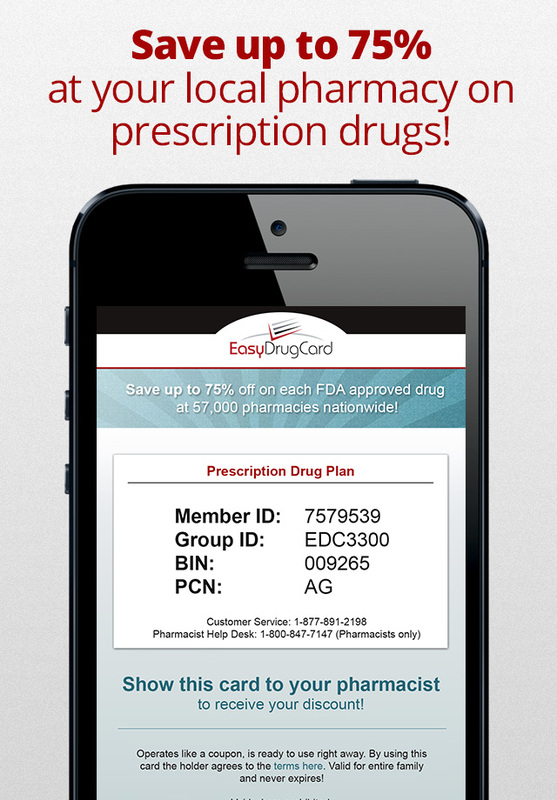 Free Easy Drug Card App to Save on Prescription Drugs! Use Our App to Save! You can save up to 75% off on your prescription drugs at over 60,000 pharmacies. Easy Drug Card operates like a COUPON! And It’s Very EASY to Use! Enjoy instant savings at your local pharmacy on prescription medications with our Easy drug card savings program. Stop paying full price for prescriptions today. It’s easy to get, easy to use, and easy to save with the Easy Drug Card. Subscribe to our Healthy Living Tips Blog (Click Here to Read our Healthy Living Tips Blog and to Subscribe) which provides up-to-date information on medical conditions, nutrition and exercise from our pharmacist Dr. Peter J. Rice, our registered dietitian, Danielle Sikorski and our fitness expert, Davida Wright Galvin. We would love to hear from you about topics you are interested in knowing more about. Contact us at Click Here to Contact Us. Simply present the prescription card to your pharmacist when you need a prescription filled. It works similar to a coupon for all prescription medications. The prescription savings card provides access to our network of over 60,000 pharmacies. Those pharmacies include the large chains such as CVS, Walgreens, Walmart, Costco, Rite-Aid and more near you. It also includes the independent pharmacies. Use our pharmacy locator to find a pharmacy near you. You can also Check your Drug Prices before you go to the pharmacy! Use our drug pricing tool! Click to Play App Video! Our customers can save up to 75% at the pharmacy on their prescription drugs. It does not matter if you have insurance or not, our prescription drug discount card provides prescription savings for anyone. There are absolutely no restrictions or forms to fill out or limitations. Everyone is qualified immediately for our discount program. It does NOT expire! The card works great if you are uninsured or have limits on your insurance drug benefits. Since this discount program is NOT insurance there are no restrictions on birth control, weight loss drugs, lifestyle medications, erectile dysfunction , or other prescriptions medications you may need to be filled. Our app is complete with a prescription drug discount card. The discount card to already activated and can be used immediately for savings on your medications. There is a tab at the bottom to locate a pharmacy and to check drug prices. There is 800 customer service number for users and a pharmacy help desk number to call with questions. Download our app today! www.easydrugcard.com/app You will be glad you did! Begin saving with Easy Drug Card! This drug program is a discount plan and is NOT insurance and is not intended to replace insurance.